Johnny Depp and Keith Richards are collaborating once again—this time on the audiobook version of Richards’ memoir, Life. According to Hachette Audio, Johnny Depp, musician Joe Hurley, and Keith Richards himself narrate the audiobook edition of Life. 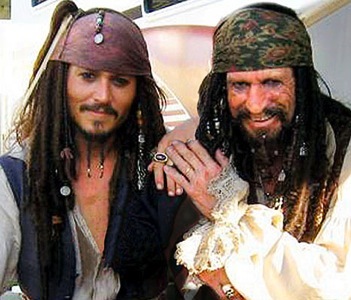 Depp and Richards are supposed to work together again on Pirates of the Caribbean 4, which is due in 2011. Richards will reprise his role as the father of Depp’s Captain Jack Sparrow despite rumors that Disney isn’t too happy with his revelations about past drug use in Life. One of the quotes that has people talking is, “It’s not only the high quality of drugs I had that I attribute my survival to. I was very meticulous about how much I took.” However, Movieline is reporting that Richards will not be cut from the movie. Both the hardcover and audiobook versions of Life were released on Tuesday.